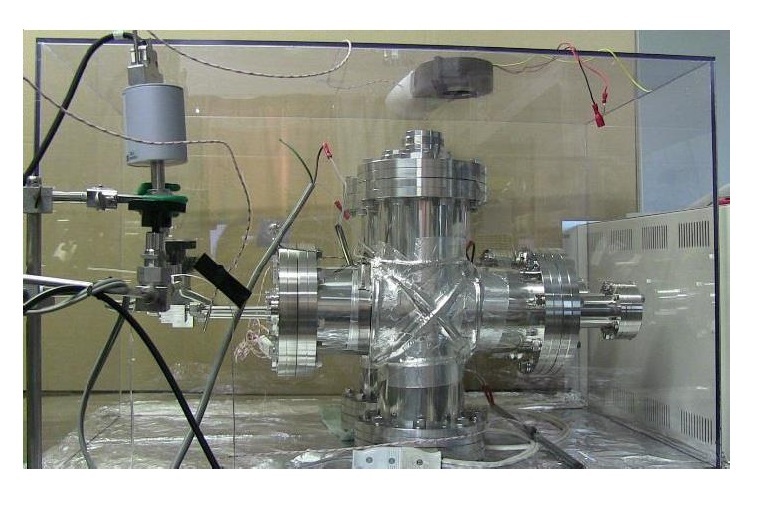 “Observation of excess heat by activated metal and Deuterium gas” reports on cold fusion tests performed in a Nickel mesh by Tadahiko Mizuno. A significant excess of heat, generated by the reactor and measured by an air flow calorimeter is confirmed by comparison with measurements performed without Deuterium and with an identical reactor in which no excess heat was generated due to the absence of active Nickel. The report is a very detailed description supported by pictures and diagrams of the various measurements. Here we shall only review the calorimetric data, and not the SEM analyses. The Author states that he has obtained an excess of power (in form of heat) almost equal to the electric input for a very wide range of power. 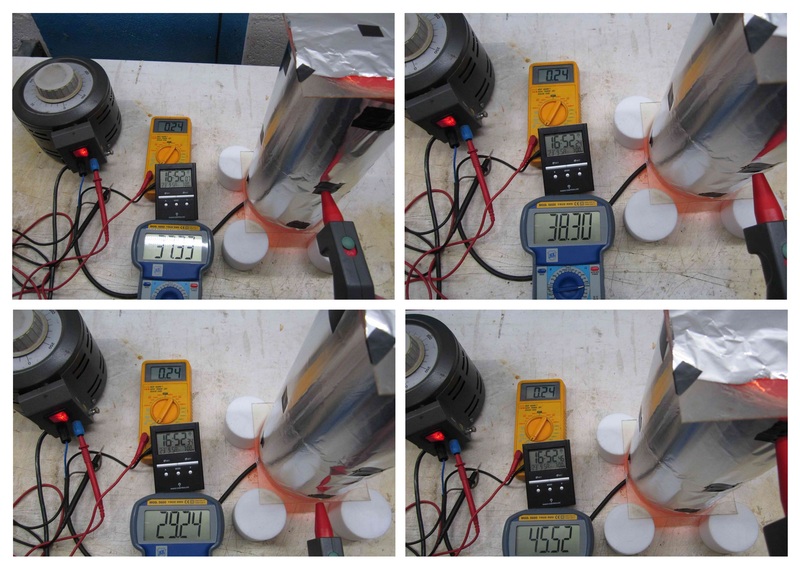 The best reported result is: input 248W, output 480 W.
When compared to the output of a dummy reactor, flow calorimetry usually guarantees reliable measurements. . When the excess heat is as large as here, only big mistakes or faked data can alter the results. We therefore looked for possible errors or inconsistencies and found many. According to the Abstract with the reactor at 300°C (a temperature never reached during the reported tests ) “generated energy” is 1kW. On page 20 though, the maximum excess power measured is 480W with a 500W input as shown in Figure 29; in Figure 30 at 300°C the expected excess is 650W; on page 24 it is necessary to reach 700°C for an estimated excess of 1kW, but in Figure 40 that same power would be reached at 400°C. Some errors seem to show that the Author does not know the theoretical bases of the calorimetry he used. Other errors are procedural and seem to show that the Author does not know basic laboratory practice regarding calorimetric and temperature measurements. All these mistakes seem absurd considering that Tadahiko Mizuno, 72, has a degree in applied physics and has taught at Hokkaido University in the Nuclear Engineering Institute. If Hc refers to the value of Cp to be used in subsequent calculations, the variable should be (Tout + Tin) / 2 and not Tout. Moreover, the values ​​obtained from this expression appear meaningless both for absolute temperature (T) and for temperatures in degrees Celsius. In any case, this is a needless speculation: the Author concludes that the error introduced in the absence of such a correction would be 0.3%, totally negligible compared to the 100% excess heat measured. It states that incoming energy is expressed by the integral from 0 to T of W·t dt whereas it is clear that it is the integral from 0 to t of Wdt. The Author uses T to indicate the end time and W·t dt for what is presumably Wt dt (elsewhere the subscript is used correctly). The expression ΔW instead of W, is wrong as well: according to the Author the incoming energy would be the product summation of two differences. in the summation a speed difference is indicated instead of a speed. The letter T, used as second integrating limit, represents the final time, while in the integral that same letter indicates the temperature (written as dT instead of ΔT). Note that the Author shows the energy input and output in (2) and (3), but all the diagrams show the trend of incoming and outgoing instantaneous power. one wonders when an expression would be “empirical”. The meaning of dT is specified although it does not appear in this formula which thus provides an air output speed of 0.3 m/s with the fan switched off. 1e – On page 2, the Author makes a great deal of confusion about the Nickel mesh. He writes that the wire diameter is 0.055mm which would actually correspond to a total surface of 0.31m2 as reported, but in the line underneath the wire diameter becomes 0.15mm and the surface would have to be 0.84m2. In both cases, the declared weight of 23g is incorrect (36g and 268g respectively). Even the total wire length of 896 meters would be wrong (correct value 2,550m) if the number of 180 meshes per inch indicated by the Author is correct. The above-mentioned errors should be a post hoc theoretical explanation of the measurements, but the Author or his translator from the Japanese is not familiar with the formulas. Still, measures could have been carried out properly. Unfortunately, the Author does not provide the actual calculations that led him to declare the excess heat. His data and diagrams, however, reveal that the obtained results are not consistent. The description and photographs show how both the calorimetric and the comparison measures are affected by serious mistakes that make the excess heat most unlikely. 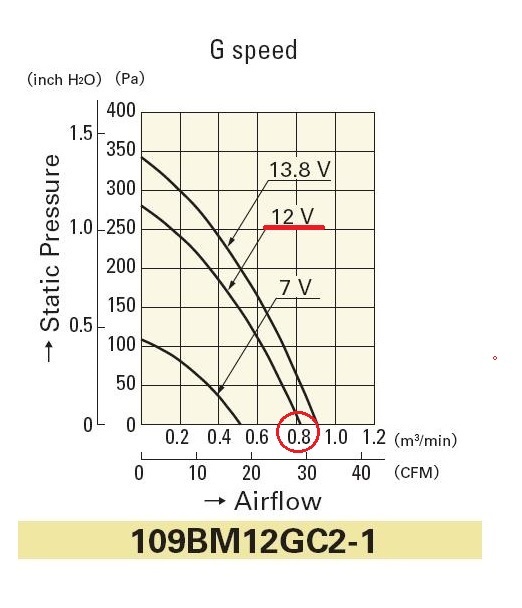 Actually, as seen from the characteristic curve of the fan (109BM12GC2-1 powered by 12V) in Figure 1, its maximum flow rate (without back pressure) is 49m3/h: about half the reported rate. By a strange coincidence whatever the power entered into the electric resistance, output is twice the input power. That the air flow could not exceed 50m3/h is absolutely sure, so one wonders how twice that flow could be measured by an anemometer. The most likely explanation is that air velocity was erroneously measured at the outlet conduit area of 82cm2 (in fact the calculation errors made on page 2 regarding the surface and weight of Nickel seem to indicate that the Author does not know how to calculate the area and the circumference of a circle). An 82cm2 area corresponds to a pipe with a diameter of 100mm, but as can be seen in Figure 14, reproduced here as Figure 2, the diameter appears to be considerably smaller (the outside diameter of the fan being 95mm). A section of 41cm2 (half of that considered by the Author) corresponds to a diameter of 72mm which appears reasonable considering the picture shown in Figure 2. 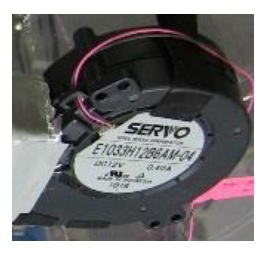 From Figure 2 (detail in 2bis) it is also clear that the fan is a SERVO E1033H12B6AM-04 and not the one stated in the report. Figure 3 shows the characteristic curves of this fan. As we have seen, it has a free flow rate of only 40m3/h, that is lower than 109BM12GC2-1. But why does the calorimetry appear correct in the dummy reactor case? Why is it correct even with the “real” reactor but in which vacuum has been made and no Deuterium was introduced? The mistakes that led to estimate twice the actual flow should also be present in the control measurements, which, according to the Author, showed a heat output equal to the energy input. Although measurement errors, as we shall see later, are plausible answers to these questions they imply a series of random coincidences so unlikely that it cannot be ruled out that some of these measurements have never been made and have been added subsequently or that they have been “adjusted” to give the results more credibility. Before an in depth analysis of the calorimetry, it is appropriate to check the measurement of the surface temperatures of the various reactors. The external temperature of the reactor containing active Nickel (henceforth the “real” reactor) was superior by far to that of the empty/blank reactor (henceforth the dummy) which was obviously producing no excess heat. The Author presents the surface temperatures of both “real” and dummy reactors in Figure 19 and 25 (our Figures 4 and 5). The “real” reactor loaded with Deuterium was at a significantly higher temperature (about 30°C) and this, according to the Author, would be a demonstration of the abnormal heat produced inside. The maximum external surface temperature of the dummy charged with Deuterium was about 80°C while the maximum external temperature of the “real” reactor loaded with Deuterium was about 110°C. Supposing that no abnormal heat was generated, since the reactors were apparently identical, it should be assumed that they had a different emissivity (the “real” less than the dummy) or that their different location inside the room led to a different surface temperature due to different convective motions and resulting in a different exchange coefficient. Let’s check if the first hypothesis is plausible. Let’s look at the second possibility. As can be seen in Figure 11 and 16 (our Figures 6 and 7), the “real” and dummy reactors were placed together inside the measuring chamber, one beside the other. Supposing that the reactor placed in front of the inlet air was the dummy, it was brushed by the air in swift motion, so the exchange coefficient was no longer natural convection as it was for the “real” reactor away from the opening near the dummy. Experience shows that this speed effectively increases the exchange coefficient by about 50% (see Appendix B). It is therefore clear that the measured temperature differences on the outside of the reactors do not show an abnormal event within the “real” reactor, but can be explained away by a difference in the emissivity of the surfaces of the two reactors and / or in the convection coefficient due to the wrong decision of placing both reactors inside a measuring chamber that had an air intake near one of them. As will be seen later, the Author states he checked that the “real” reactor in the absence of Deuterium did not exhibit excessive heat. If we are right, he should have realized that the surface temperature was kept higher on the “real” reactor without Deuterium than on the dummy unless the positions inside the chamber were exchanged. Indeed, since there was no Deuterium inside (due to its excellent thermal exchange, it tends to equalize the surface temperature of the reactor), in the case of the vacuum “real” reactor, the maximum surface temperature should have been higher than on the “real” reactor loaded with Deuterium. Strangely, the Author reports three diagrams of external reactor temperatures, but none for the “real” reactor under vacuum. Such a diagram would prove us wrong. Let’s go back to the calorimetry. If the air flow was half that supposed by the Author, then the thermal output from the “real” reactor (product of the flow rate times specific heat of the air times the increase of temperature) coincided almost exactly with the power input, provided the temperature reading was correct. Since the “real” reactor (which the Author claims generated twice the input power) and the dummy reactor were identical for all geometric aspects and both were loaded with Deuterium, we think that the lower output power of the dummy was due to the fact that the two reactors were not exactly in the same position and that the air inlet was near one of the two. This, however, cannot explain why “real” under vacuum reactor gave half the result of the loaded one, unless it had been tested in a different position inside the chamber, or the thermal exchange inside each reactor was very different and generated a different distribution of the external surface temperatures thereby greatly altering the measurement. The problem of the “real” Deuterium-less reactor will be discussed later, for now we consider the “real” and dummy reactors, both loaded with Deuterium, positioned side by side as shown in figure 6. Let’s consider the first possibility: part of the heat was dispersed. If part of the heat exchanged by the tested reactor was dispersed by the walls of the measuring chamber, only part of the heat generated by the electrical resistors would be measured by the calorimeter. It’s obvious that part of the heat coming out of the reactor under test was dispersed and did not pass through the fan, since the large uninsulated measurement chamber certainly dispersed heat. We can estimate whether the dispersed heat was negligible as the Author claims (he states on page 13 that the error is less than 2%). To which we have to add the heat exchanged by radiation. The infrared rays emitted by the reactor cannot escape through the plastic walls, but they raise the wall temperature which then disperses heat by convection partly on the inner face (which is exchanged with the air inside the chamber and measured) and partly on the outer face (which is lost). where the value of 2.2m2 is the total area of the chamber, including the lower face not exposed to air. Part of this power, however, was transferred to the air inside the chamber, so only a little more than half was really lost (if we consider the internal laminar coefficient of exchange equal to the outside one and the outside air temperature not much less than the internal one). In total, we can therefore estimate that about half of the electrical power in the reactor under test would not be “captured” by the calorimeter. That means an efficiency of about 0.5.
where 1.15 kg/m3 is the air density at 30°C, 1007J/kg·K is the specific heat at constant air pressure at ambient temperature. Did the Author not realize something was wrong? In fact the air real flow rate was 40 to 45 m3/h, and the calculation would give a 60W output power, indicating that almost half of the input power was dispersed. Before proceeding with the analysis of the calorimetric measure, it is necessary to focus on the trend of the room temperature. Although the Author claims to be aware that the ambient temperature varied considerably during the experiments, he argues that this was of no importance since he adopted temperature differences. This statement is partly true. The specific heat of the air is almost independent of the temperature, even he writes on page 11: “The specific heat of constant pressure air of Cp is hardly affected by temperature“. On the next page, Author writes that this “strong” dependence on temperature is negligible. The Author should have wondered why the ambient temperature varied so much. A variation of 5°C, as can be deduced from the diagram in Figure 20, is very unusual in a normal environment in which masonry inertia prevents rapid changes in room temperature: did he make the measurements in a teepee? A plausible explanation might be that they happened in winter with the heating switched “off and on” or in the summer with an air conditioner near the calorimeter (but the Author on page 14 states: “there is no air conditioner in the laboratory“). The room temperature of 19°C measured during the recording of the dummy (Figure 20) and of 26°C measured during the recording of the diagram of Figure 26 (“real” reactor) plainly show that such measurements have been carried out at a great distance from each other, probably the first in winter and the last in summer (without an air conditioner). When comparing two systems, it is necessary to set them in a very similar environment and in a short time so that hidden variables cannot cause differences that lead to wrong conclusions. In any case, an air flow calorimetry working with a ΔT of a few °C in an environment that changes its temperature of 5°C every 15 hours cannot be trusted. Figure 20 shows another anomaly: at the end of the test the temperature read by the room probe rises by 2°C in a few minutes and by 5°C in 2 hours while the output temperature remains almost unchanged. 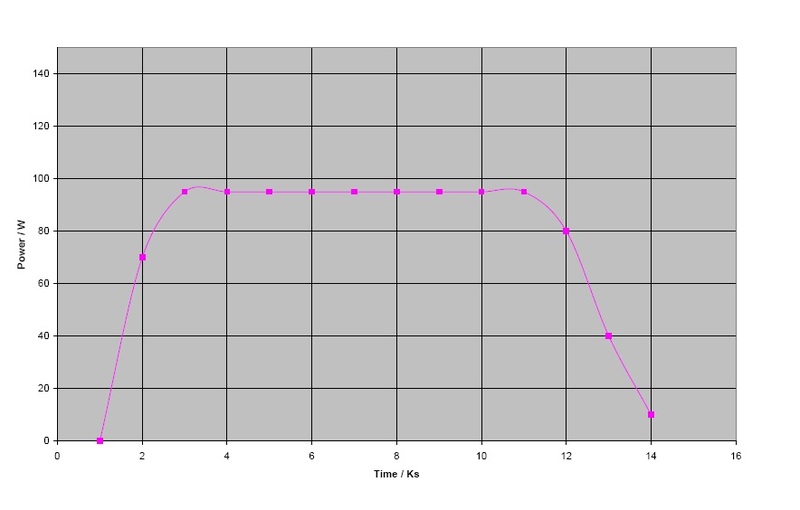 Our hypothesis is that at the end of the test (t = 73000s) both the reactor heating and the fan were switched off and data continued to be recorded for another 3 hours (up to the end of the diagram at the instant t = 83000s). During these 3 hours the air was no longer taken in the measurement chamber by the fan, so there was only a poor exchange due to the natural draw. The temporary increase in the output temperature is due to the thermal inertia of the reactor which heats a very small air flow. The rise in the inlet temperature is mainly due to the radiating hot reactor (remember that we previously assumed that the dummy was close to the air inlet). The energy received by radiation from the probe was no longer eliminated by the air flowing at high speed when the fan was operating, and the probe immediately indicated an increase in temperature (2°C), due to the small natural airflow. Then the reactor slowly began to cool (it has a mass of more than 20kg), the air velocity due to convective motions has further decreased so that the probe continued to indicate a rising temperature but with a lower rate until, at the end, it reached almost the same temperature as the output probe (strangely it differs by 1°C). A different explanation cannot be ruled out, however: as the room temperature decreased below 19°C (instant t = 73000s), some environmental heating system was switched on and it generated the rapid increase in room temperature. The peak output temperature after the switching off of the reactor heating would be due to the thermal inertia of the system. The fact that at the end the output temperature is even lower than that of the input, in any case, remains puzzling. Let’s go back to the calorimetry analysis to investigate the second hypothesis formulated earlier: the reading of the temperatures was incorrect. As assumed at the previous point, the probe reading the room temperature was exposed to the radiation of the nearby reactor (which we assumed to be the dummy). This suggests the hypothesis that during the tests carried out on this reactor the ambient temperature would be overestimated. instead of the measured 4.5°C. The error (1.2°C) would have led to overestime the output power from the “real” reactor by 36%. This means that the radiation of the probe is not enough to explain all the excess heat measured, equal to 100%. Were it the only reason, the error should have been 2.2°C. That the probe would actually register a modest radiation from the dummy is plausible, since probes normally have a polished steel casing with low emissivity. This, coupled with the modest emissivity of the reactor, with the small solid angle of exposure and the good coefficient of laminar exchange on the probe, leads to the conclusion that it is unlikely that the excess power measurement derived mainly from an overestimation of the ambient temperature during the test with the dummy reactor. Since there is no reason to think that the flow of the fan was different during the “real” reactor and the dummy tests, all that remains is an overestimation of the air outlet temperature during the test with the “real” reactor. If only 50% of the 100W inputs were actually passed on to the air that crossed the fan, it means that ignoring the power output from the fan leads to a 10% error. The Author ignored this error, but it cannot explain the difference in temperature between the different tests, even considering that this error was common at all tests. At this point, all that remains is to think of an overestimation of the output air temperature only in the case of the test with the “real” reactor loaded with Deuterium. Figure 16 in the report shows that the conduit with the fan was positioned above the reactor away from the ambient air inlet, where we have assumed the “real” reactor was placed. 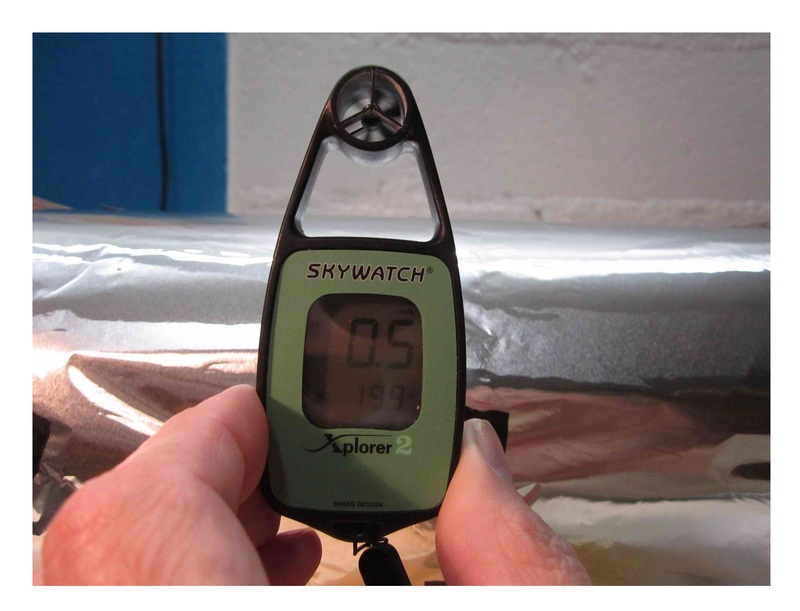 Figure 14 also shows that the resistance thermometer which measured the air temperature was positioned at the end of the duct, with the connecting cable fixed to the transparent plastic ceiling of the chamber, just above the “real” reactor. The “real” reactor, contrary to the dummy, was positioned just below the probe. It also had a higher surface temperature thus giving rise to higher radiation (Note 7). To this should be added that the “real” reactor, which was at a surface temperature of 100 – 110°C, generated a stream of hot air venting up by natural convection not disturbed by the air inlet behind the dummy reactor. 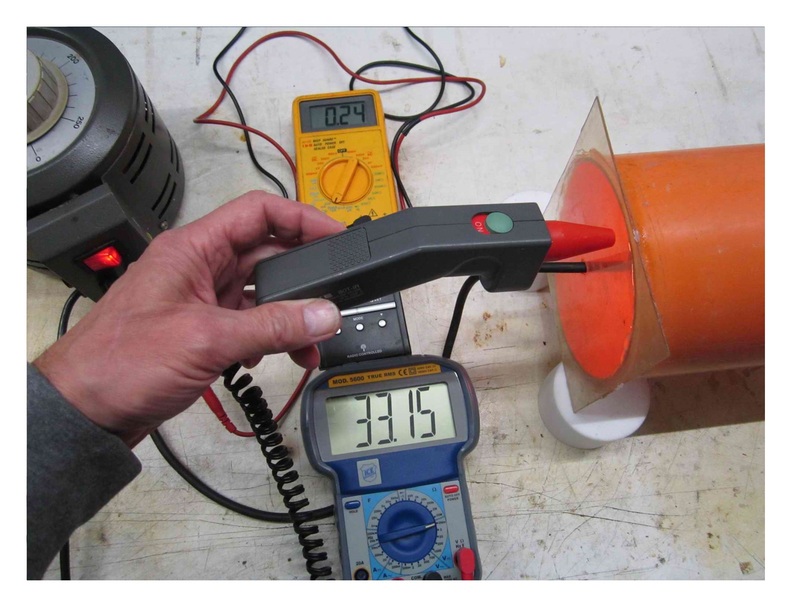 Our hypothesis is therefore that the probe, in the “real” reactor test only, read a higher temperature because the hot plastic ceiling transferred heat to the probe connection cable (it had copper conductors, probe being a PT100). To explain the apparent excess heat in the most striking case (measure output 980 W), we can calculate a 50% error in the reading of the output temperature. 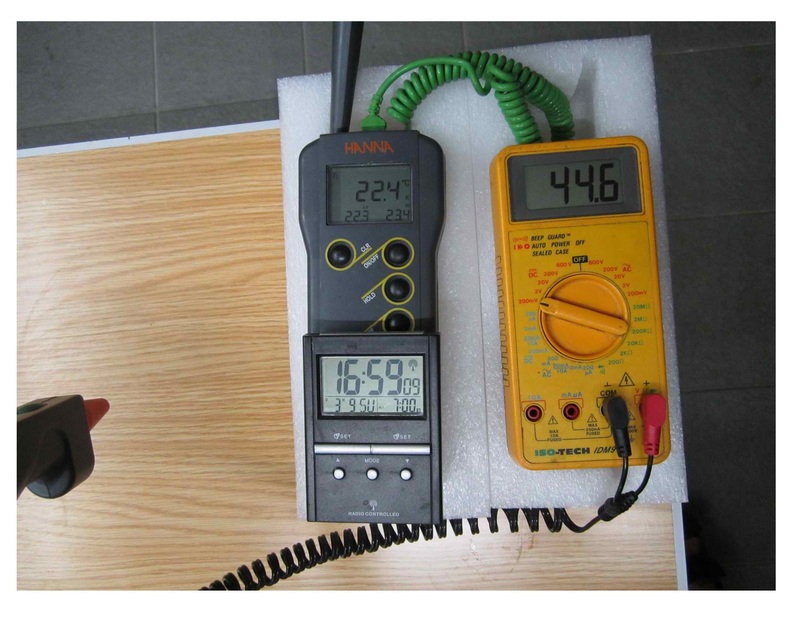 Although the Author does not state the outlet air temperature at this power level (page 11 reports a typical temperature of 60°C during the test), assuming an ambient temperature of 22°C, he probably measured a temperature T = (980/100) · 4.5 + 22 = 66°C. The different air movements inside the calorimeter chamber could at least partially explain the higher measured temperature with the “real” reactor. During the tests on the dummy, the cold air first moved over the hot reactor then went to strike the walls of the chamber yielding part of the heat received. On the contrary, during the test with the “real” reactor the cold air inlet slowed down before reaching the hot reactor, and went up by natural convection without impacting the walls of the chamber. The hot air was accumulated only in the upper part of the chamber, dissipating less heat (the efficiency of the calorimeter was greater). Furthermore, the hot air warmed the ceiling of the chamber more, increasing the temperature of the probe by conduction as explained above. All these factors probably coexist and together they can explain why the outlet air temperature was higher with the “real” Deuterium-loaded reactor. However, they do not explain the same air temperature for the “real” Deuterium-less reactor and the dummy (although the Author declares that in this case he measured a slight excess of power, which he attributes to Deuterium residues). 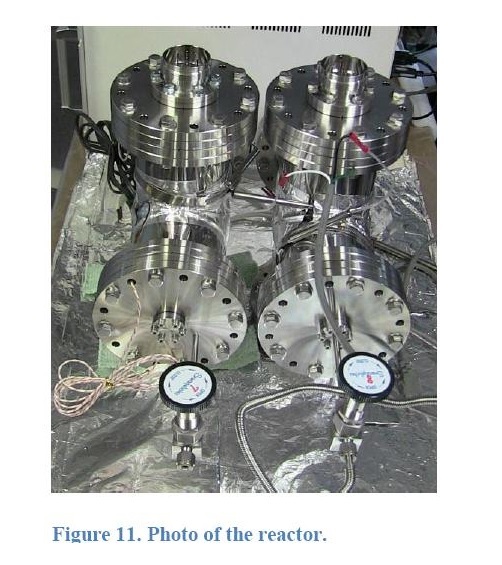 It must be noted that on page 8 the Author writes: “Both reactors are shown in the photo. These can be tested separately, or at the same time“. 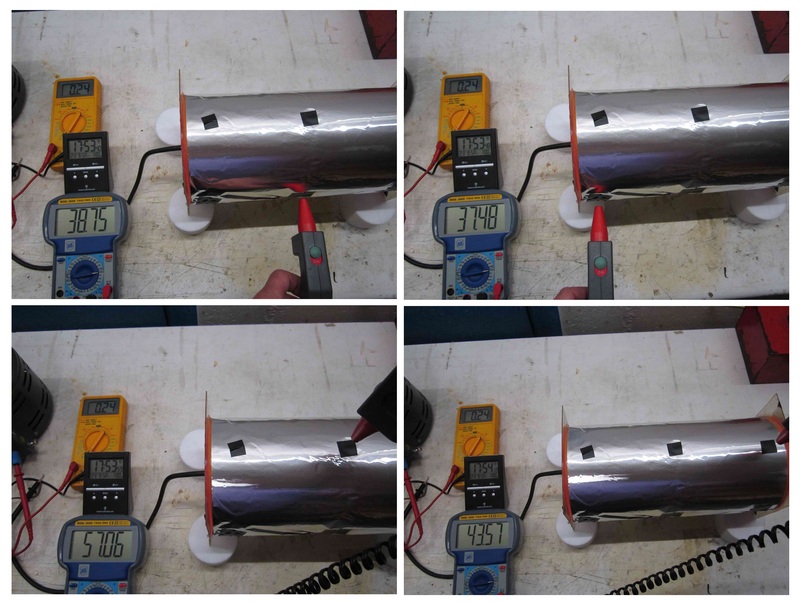 This suggests that he carried out tests with two reactors within the chamber as shown in the photos, but also with a single reactor inside it. If the test with the “real” reactor under vacuum had been performed by placing it alone inside the chamber, perhaps in the same position normally occupied by the dummy, it would clearly give the same results as the latter. In all the diagrams relating to the air outlet temperature (Figures 20, 23, 26 of the report, the latter reproduced here as our Figure 9) the reading of the output temperature is very noisy, while the reading of ambient temperature is not. 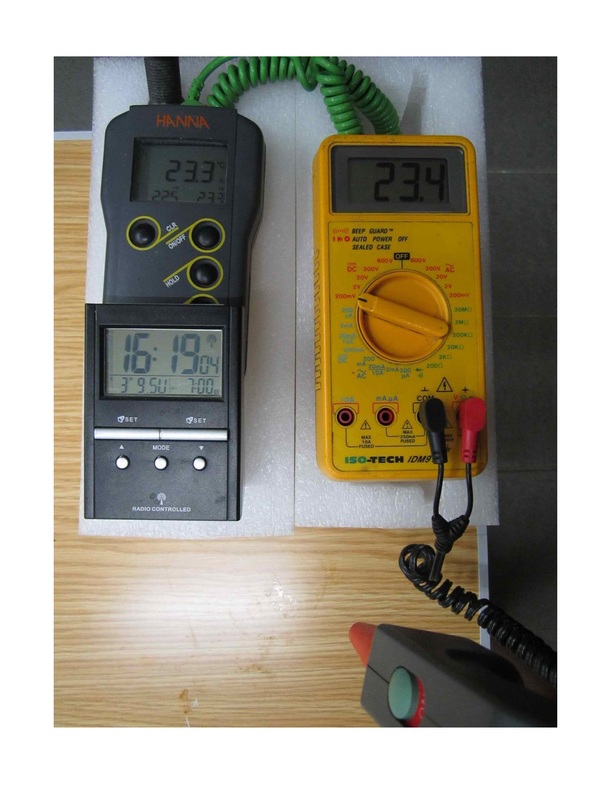 On page 16 the Author states that : “the variation of the outlet temperature is about 0.5°C. This is presumably because the amount of excess heat generation varies.“. But in all the diagrams (e.g. Figure 25, the reactor surface temperature), is absolutely stable. The same happens to the dummy in Figures 18 and 23.
a – Electromagnetic interferences. Possibly but strangely, they might not have disturbed the reading of the other probes. Figure 16 shows that the Author correctly used a variac to adjust the power of the resistance. 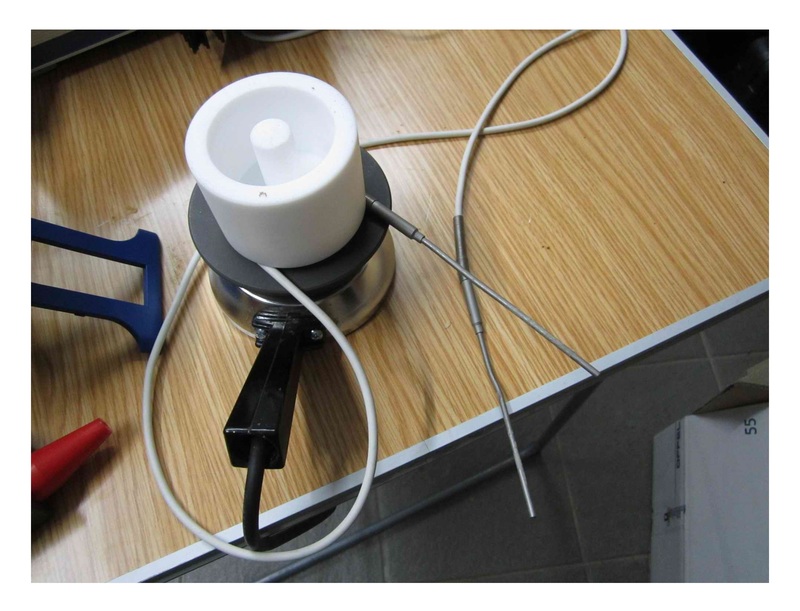 As a simple autotransformer, it practically produces no electromagnetic interference. 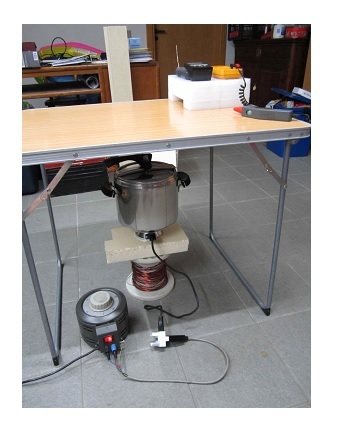 Perhaps the noise was originated by the fan (equipped with an electronically commutated DC motor). This would explain why only the output of the probe very close to the fan was affected and the data-logger reading was not filtered. Since it performed a reading every 24.47 seconds, it is more likely that the Author introduced a one-second filter at least, which would eliminate any electromagnetic disturbance. b – Fan vibrations. Assuming the output probe was in contact with the hot wall of the air outlet duct, perhaps this contact was uncertain and, as a result of vibrations of the fan, it gave rise to variations in reading. This hypothesis would explain why the noise in the majority of diagrams increases in lockstep with the temperature. 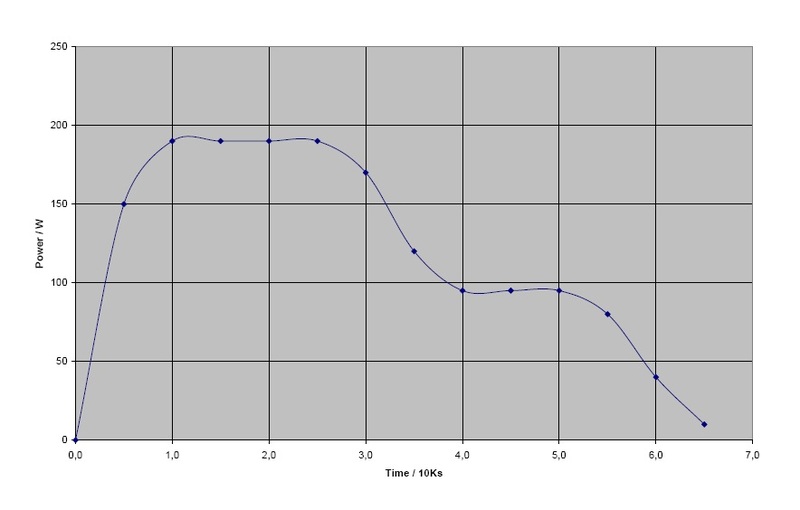 In Figure 18 the trend of the calculated power output shows oscillations at the beginning of the test as well, when the temperature was close to the ambient, so this explanation could be wrong. However the changes in that area of the diagram are approximately ± 2W corresponding to a variation in (Tout – Tin) of approximately ± 0.1°C which is the resolution of the two probes. The steady-state power variations are instead of ± 10W which corresponds to a variation (Tout – Tin) of approximately ± 0.4°C. c – Air layering. 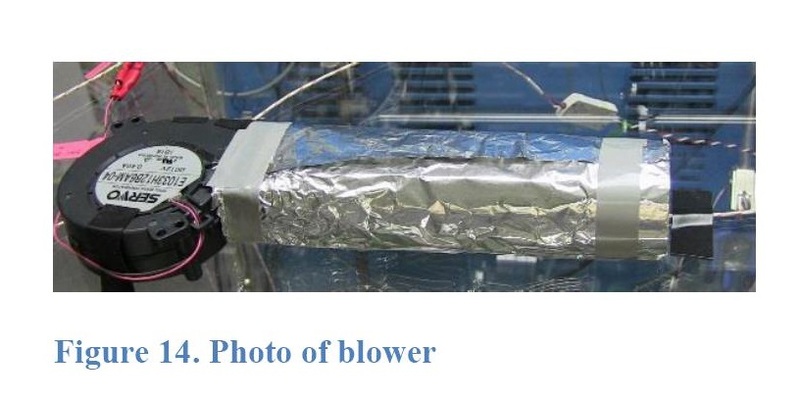 The fan may have drawn in air at variable temperatures as a result of different temporary convective motions inside the calorimeter chamber. These phenomena are proportional to temperature and the oscillation period normally ranges from seconds to many minutes and would not be filterable by a simple filter on the data-logger. Even in this case we can apply the considerations made in the previous point, and we believe it is the most likely hypothesis. d – PT100 amplifier defect. A bad contact in the amplifier or in the sensor or a problem to the data logger channel could explain the phenomenon, but presumably the tests took place over many months so it is strange that the Author did not notice it. Furthermore, this hypothesis hardly explains the noise and the temperature increasing in lockstep. Whatever the explanation, such temperature uncertainties do not belong to a correct calorimetry. 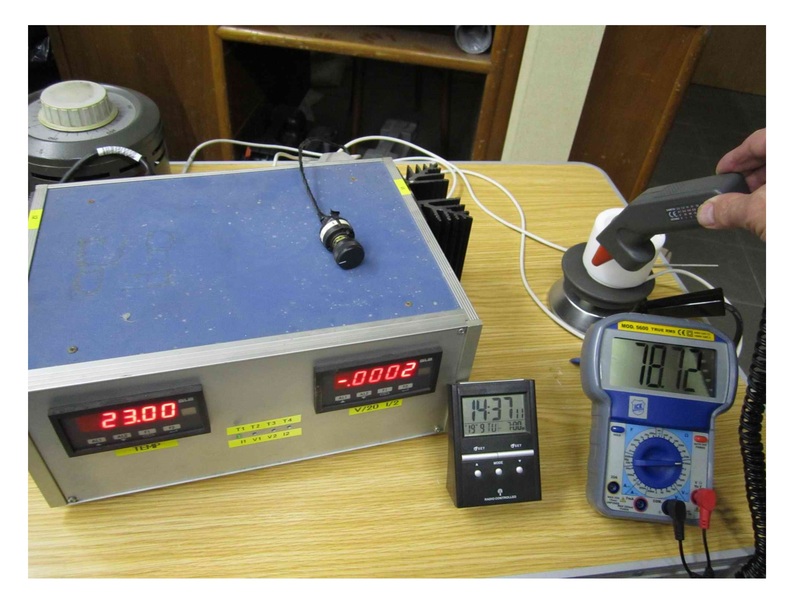 It would have been interesting to see a diagram relating to a high-power test, when the temperature measured at the outlet was more than 60°C but unfortunately, for unexplained reasons, the Author gives only comparative results in Figures 27 to 30. On September 8, 2017, the Author released an update removing some errors while adding others. In particular, he acknowledges the area of the outlet duct should be 44cm2 instead of 82cm2 as still stated on page 13. He seems unaware that the air flow was therefore 40 – 45m3/h and not 108m3/h and writes on page 13 that, by means of smoke, he measured a room crossing time (0.21m3 ) of 7 seconds. Has he never heard of preferential motions and does he really think that smoke will begin to come out after a time equal to V/Q, V being the volume of the chamber and Q the flow rate of the fan? Is it possible that the Author is not aware of the inconsistencies of his measures? In the formulas, the Author eliminates the integrals that were meaningless but introduced further confusions in the summations. ΔW is used as a symbol of power but represents a power difference. ΔV stands for V and ΔT is omitted. Hc should be the specific heat, but becomes Cp in the explanation of the formula. The data values, however, still do not coincide with the values written on the previous page and Tout is still wrong. On page 2 the diameter of the Nickel wire is corrected, its area and weight are still wrong. On page 17 the energy produced rightly decreases from 82.5MJ to 8.25MJ but there is an additional mistake, 8.25ks instead of 82.5ks. This botched revision together with the statement that the air flow rate was half the one used in the calorimeter calculations confirm our completely negative judgment on the work presented. Note 1 The calculation is only indicative since the surfaces of the reactors are considered isotherms while the Author indicates differences in temperature up to 20°C on the surface of each reactor and the surface convection and radiation are considered equal, which is clearly an approximation. The fact that the two approximations are applied to both reactors, however, leads to say that the result, qualitatively, is reliable. The emissivity of polished stainless steel is extremely variable and depends on the degree of polishing and on surface coatings (oils, polish, etc.). The literature reports a range of variability between 0.25 to 0.7. Note 2 The Author, on page 9, argues that both the inlet and the outlet of the air in the measuring chamber were 50mm diameter holes. Since the suction port of the adopted centrifugal fan has a diameter of 52mm, it is plausible that the diameter of 50mm was actually used for the hole on the chamber ceiling. The air inlet hole in Figure 12 (in the box with the walls still covered by the protective film) appears to have that diameter, but the statement is clearly contradicted in Figure 16 (two pictures side by side) showing the complete set-up: the used inlet opening was a large window through which cables and piping also passed. Using a wide opening for the air inlet is not in itself a serious error, but it leads to an inaccurate measurement of the inlet air temperature due to the fact that the height at which it is necessary to measure this temperature is not determined. The air temperature in a room in fact varies by many degrees from floor to ceiling, especially in the case of a room without proper thermal insulation like the one apparently used by the Author (having regard to the large thermal excursion during the experiments). This means that with an opening height of over 30cm, as here, the air temperature varies few tenths of a degree from the lowest point to the highest. Considering that we are measuring temperature differences of the order of 5 degrees, the uncertainty increases by more than 5%. More important still, in an airflow calorimeter you never use a large inlet hole because air currents within the chamber can generate problems as previously explained. Note 3 This was based on the size stated by the Author on page 9, although if the width is 0.4m, in Figure 12 the stated height (0.7m) appears higher than the real one. Note 4 A flow calorimeter should have an efficiency (or capture ratio) of at least 0.9 in order to be trusted. Obviously, the measure is normally lower than the actual one due to the dissipation, unless power is entered in other ways, in this case through the fan (5W). Note 5 Another way to achieve the same result is to consider a steady decrease over time of the ambient temperature of 5°C every 15 hours, equal to 0.33°C/h. The thermal capacity of the entire calorimeter is equal to the sum of the thermal capacity of the two reactors within and that of the plastic chamber. The first two are composed of stainless steel and weigh a total of about 40kg. The acrylic plastic chamber, if 10mm thick, weighs about 18kg. The specific stainless steel heat is 500J/kg·°C, that of the acrylic plastic is 1500J/kg·°C. The thermal capacity is therefore: C = 20000 + 27000/2 = 33500J/°C were only half the mass of the chamber walls is considered, since half of its heat is transferred to the outside air and not included in the calculation. A variation of 0.33°C/h of the entire system will correspond to a transfer of heat to the air (and therefore interpreted as generated power) equal to: P = 33500 · 0.33 = 11055 J/h = 3W. If we consider that the real power transferred to the air flowing in the fan in the case of 100 W input was about 40 – 50 W, this value corresponds to approximately 6–7 % as calculated with the previous method. Note 6 If we assume that the flow rate of the fan is approximately 45m3/h, the manufacturer’s diagram shows that the pressure drop corresponds to about 25 Pa. The useful power for the movement of air is then 0.3W. The rest of the input power to the fan is turned into heat from the motor and the air friction. Pr / Pd = (3834 / 3534) = 1.4 times higher. Note 8 Page 13 states that the pressure of the Deuterium was very low, amounting to 760Pa. Considering that we do not understand the reason to operate at such low pressure and the many mistakes, perhaps the Author intended 760 mmHg, corresponding to 1 bar. from which Tc = 99°C. Actually, the inside air coming from natural convection on a reactor at 250°C had to be significantly warmer than 60°C, so it is presumed that the temperature of the ceiling was higher than calculated here. To check whether the hot reactor (up to 250°C), placed under the horizontal ceiling of the calorimeter chamber, could raise significantly its outside temperature, we have prepared the simple set-up shown in Figure A1. A common pressure cooker full of water, maintained just below 100°C by means of an electric hotplate powered by a variac, simulated the reactor. The tabletop of a camping table (plastic) simulated the ceiling of the calorimeter chamber. 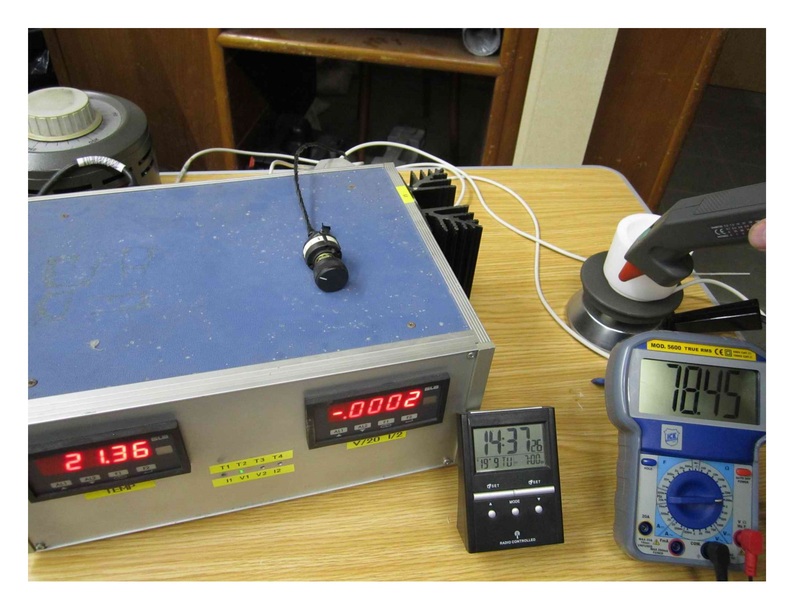 The ambient temperature was read with a portable digital thermometer and the surface temperature of the table by a pyrometer connected to a tester. Figure A2 shows the situation a few moments after the surface of the pressure cooker was placed at 20cm from the table top. Figure A3 shows the situation once the temperatures stabilized: the temperature of the tabletop increased by 11.5°C. Figure A4 shows the situation with the lid of the pressure cooker just 7cm from the tabletop: the increase was more than 21°C. 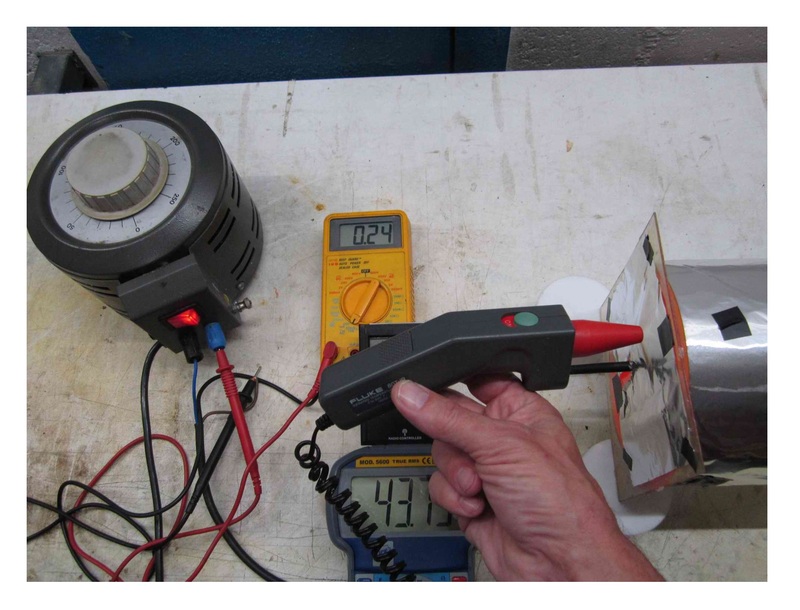 This confirms that the air outlet duct and the cable of the outlet probe were in contact with a surface with a temperature considerably higher than that of the air sucked by the fan of the calorimeter. We checked whether the value we used for the coefficient of laminar exchange (8W/m2·°C) was reliable for a geometry similar to that of the reactor used by the Author. 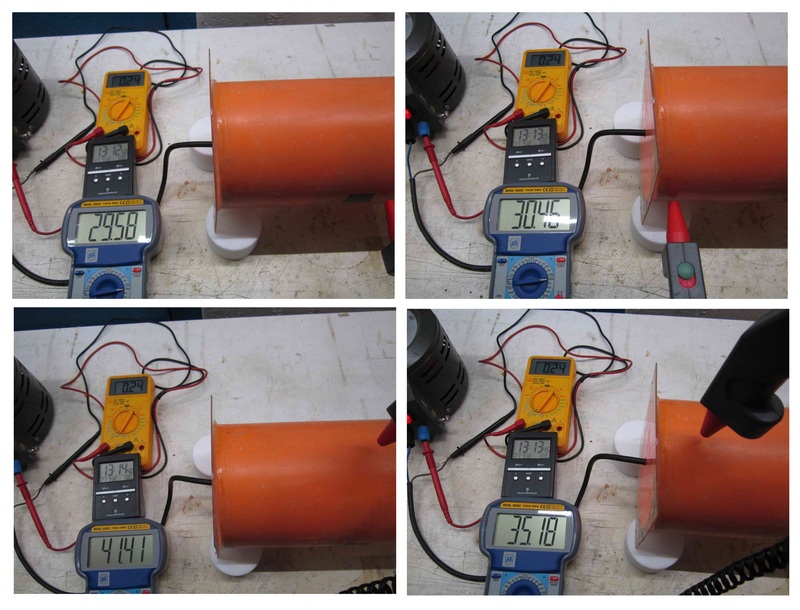 As can be seen in Figure B1, we used a plastic cylinder with a diameter of 140mm and 300mm long (total exchange surface = 0.163m2). Inside we placed a common incandescent 100W bulb underpowered by means of a variac so as to deliver 20W (87V; 0.24A) and we shielded it with aluminum foil. The ambient temperature was 20.3°C. The outer surface of the tube has been coated with polished aluminum foil. After a few hours we measured the temperature of the wall of the tube with an optical pyrometer focused on small black zones made of black adhesive tape. The test was performed with the axis of the pipe both horizontal and vertical, as in figures from B2 to B11 which show some of the surface temperatures measured once the steady state conditions were reached. Using plastic material (PVC) instead of stainless steel increased the temperature differences from point to point (as highlighted by the Author) due to the lower thermal conductivity, but averaging the temperatures for the various areas we obtained an average value for the exchange coefficient in the two cases (horizontal and vertical axis). 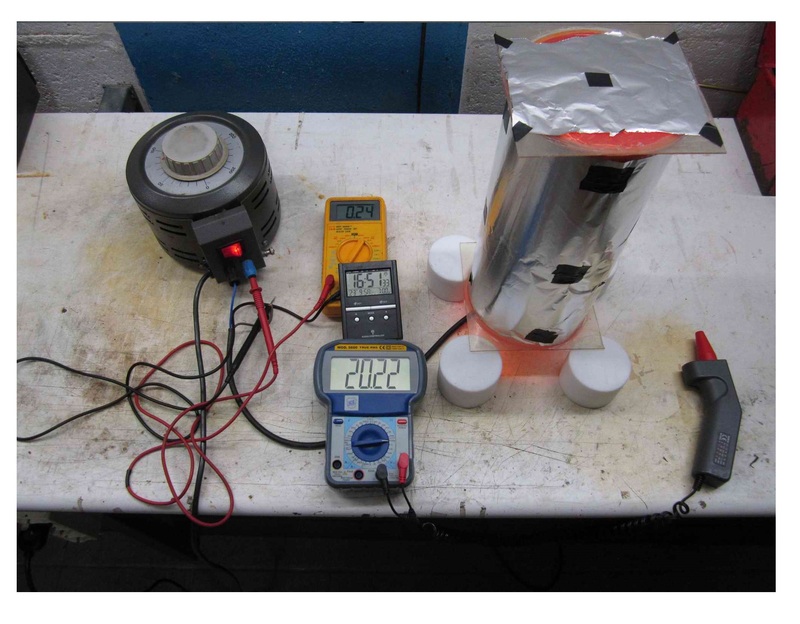 Since the temperatures were low enough (we have deliberately limited the power to 20W) and the emissivity (polished aluminum <0.2) was very low, the power dissipated by radiation was small (<2W) and the heat was dissipated practically only by natural convection (we considered dissipation by radiation equal to 1W). The obtained values of the coefficient of laminar exchange were virtually identical in the two cases and equal to λ = 7.5W/m2·°C. The value we used for the coefficient of laminar exchange of 8W/m2·°C appears to be confirmed with sufficient approximation for this analysis. 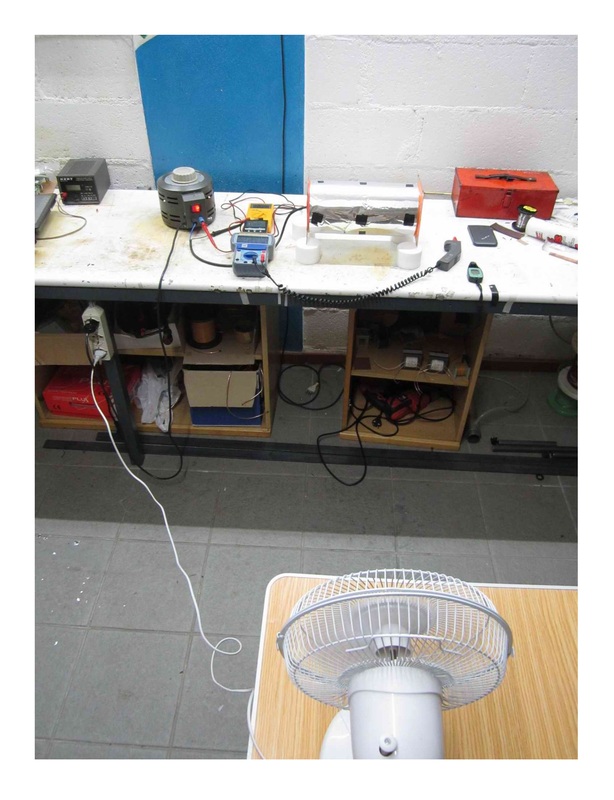 We then placed a fan as shown in Figure B12 for an air speed of 0.5m/s (Figure B13). In figure B14 and B15 some temperatures detected indicate almost a doubling of the coefficient of laminar exchange. We have also carried out measurements without the aluminum coating. The emissivity was close to 1 in readings with and without black tape. 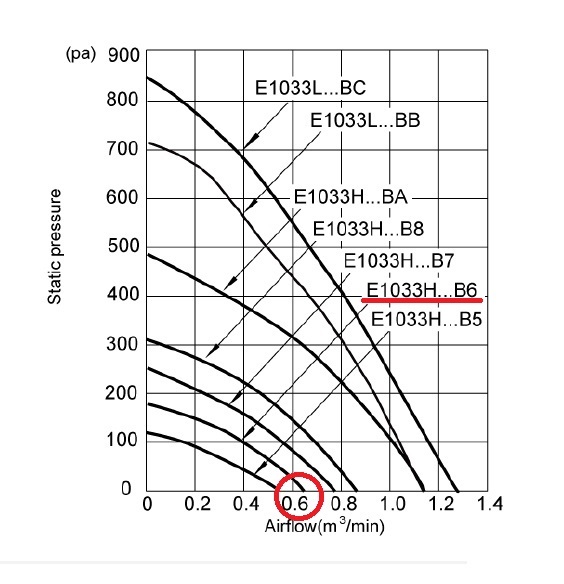 Figure B16-B20 show cooler temperatures compared to the previous measurement in static air as a result of a radiation contribution with a coefficient of global exchange (that also takes into account the contribution of radiation) λ = 13.5 W/m2·°C not far from 12W/m2·°C value we used. The large temperature differences from point to point and when the position or quality of the surfaces vary clearly shows that thermometric measures cannot be used as evidence of excess heat. We wanted to see if the heating of the back of a resistance thermometer can significantly affect the reading as we have assumed. In Figure C1, the connecting cable of a common PT100 for industrial use is placed on an electric hotplate powered by a variac in order to maintain the surface at about 80°C, to simulate the surface of the ceiling of the calorimeter chamber. The comparison was made with an identical resistance thermometer positioned very close, indicating the actual ambient temperature. If the heating of the rear part of the probe did not adversely affect its reading, the two readings would have to be identical (we used the same digital indicator switched). But in Figure C2, the probe with the cable positioned on the hot surface shows 1.64°C more. The value does not seem sufficiently high to explain the temperature read by the Author, but we have to consider that the probes we used were 3mm in diameter and 100mm long while those used by the Author were much shorter and coarser, so the sensitive element on the tip, is much more affected by cable heating. 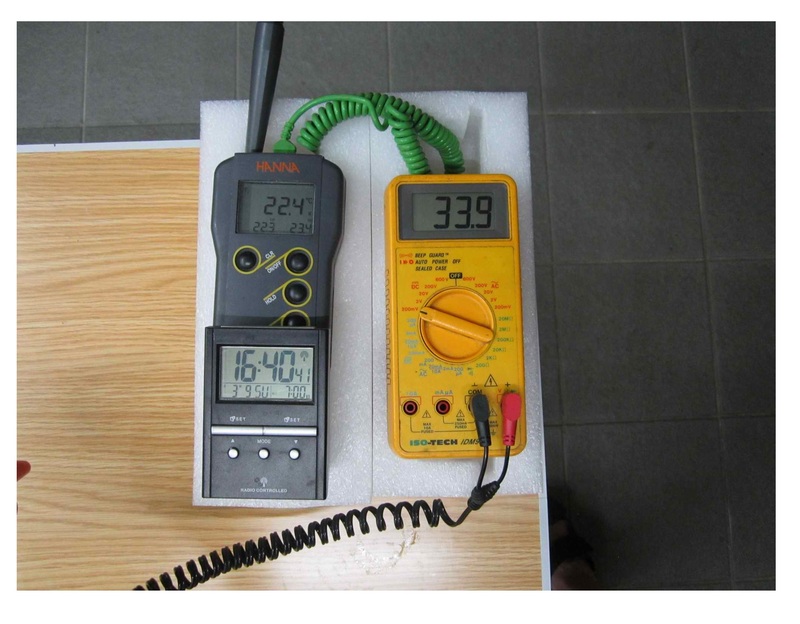 The construction of the probes may also be different, so the type used by the Author could be more affected by the temperature of the cable irrespective of the smaller length. In addition, the temperature of the calorimeter ceiling could also be considerably warmer than the 80°C we used and the probe could also receive heat directly through the wall of the fan duct, inside which the probe was positioned. 1 – Use only the “real” reactor. 2 – Replace the acrylic plastic box of the calorimeter with a slightly smaller one, fit for a single reactor, in polyurethane foam or polystyrene panels 50 mm, coated on the inner side with aluminum foil. The box will use the same current fan group (the temperature probe is after the fan, but this is negligible considering the heat excess levels declared). The box will be placed on spacers that keep it raised 10-15 mm above the supporting surface. All the cables and pipes go through this slot, in addition to air. The sensor that reads the ambient temperature will be fixed to the outside at any point close to that slot. A system of this type has an efficiency over 90%. a – bring the reactor under the conditions that, according to the Author, generates abnormal heat. Where ΔT represents the temperature difference between input and output; 50 represents the flow of the fan in m3/h; ρ is the density of air at outlet temperature in kg/m3, 1.01kJ/kg·K is the approximate specific heat at constant air pressure. The formula does not take into account losses: typically the result is in defect of 5-10%. d – make vacuum in the reactor and wait for another 5 hours. The alleged anomalous reactions are supposed to stop when the entire Deuterium has been evacuated so that at the end, if abnormal heat was produced, we will get a diagram of the type shown in Figure D1. If, on the contrary, the result is a diagram of the type shown in Figure D2, we may declare that no abnormal heat was present. Note 31/12/2017. On 28-29 December we received a lot of comments, one after another, from the same new user: Hannah Kawai. As clearly stated in our Notice webpage, massive or multiple questions and comments are not allowed, likewise the never-ending discussion. Exceptionally (just one time) we reply hereafter but further comments/questions are automatically discharged. (Q1) “but in Figure 40 that same power would be reached at 400°C.” What is your basis for saying this have you used correlation? (A1) Mizuno stated as follows: “When the temperature of the reactor (Tr) is expressed as the reciprocal of the absolute temperature, as shown in Fig. 40, the excess heat relationship is linear” (enphasis added). As shown in the Fig. 40, 1kW excess power would be achieved at a value of 400°C (ca. 673K, which the reciprocal value is about 0.0015). In the same figure, at a temperature of 700°C, an excess power bigger (above 1kW) can be extrapolated. The Mizuno’s statement written in the abstract ”When the reactor temperature is 300◦C, the generated energy is 1 kW” is wrong, because Fig. 40 itself indicates less than 1 kW of excess power. (Q2a) “The emissivity of polished stainless steel is extremely variable and depends on the degree of polishing and on surface coatings (oils, polish, etc.). The literature reports a range of variability between 0.25 to 0.7.” What are your references? (Q2b) If the reactors are reversed and the same results are obtained would this be a good check on equal emissivities? (A2b) Yes, under the assumptions of a test properly carried out. (Q2c) “we think that the lower output power of the dummy was due to the fact that the two reactors were not exactly in the same position and that the air inlet was near one of the two.” Why do you think that Mizuno would not use symmetrical positioning? It would be the obvious thing to do. (A2c) In order to ensure a reliable comparative study it would require the execution of independent tests, using an experimental enclosure containing only one reactor at a time and placing them in the same position. But, conversely, the experimental set-up implemented by Mizuno consists of an enclosure that contains both reactors, which are tested one at a time but in different positions. (Q3) “The Author should have wondered why the ambient temperature varied so much” What does this statement imply… that he did not know? (A3) This argument was already addressed in the Note 5, point 2d. The variation over time of the environmental temperature, showed in recorded trend, implies an experimental error of 7%, which does not strongly affect the final result, but that anyway has been utterly disregarded by the author. (Q4a) “As assumed at the previous point, the probe reading the room temperature was exposed to the radiation of the nearby reactor (which we assumed to be the dummy).” Are you assuming that the dummy and the active reactor are being operated simultanoeusly. or that the active and the dummy reactor are both in the chamber at the same time? (A4a) It would be meaningless to operate simultaneously with the two reactors. That both the reactors were placed simultaneously into the chamber is clear from the pictures. (Q4b) What is the basis for this assumption? Is it not simpler to run each reactor in a symmetrical position with one reactor in the chamber per run? (A4b) Exactly, but it was not the choice pursued by Mizuno. If one reactor set-up simpler why it was used an experimental enclosure of such dimension and why all pictures showed two reactors into the same enclosure? and the new value of 13 seconds does not match anymore the ratio (a mess, a further Mizuno’s mistake), highlighting that the data has been subsequently manipulated and not directly sourced from real experimental data. (A5b) Your statement is meaningless. In the development of an experimental apparatus it’s a consolidated best practice to perform start-up and optimization tests. Anyway after, when the real experimental phase is started, the measurement systems (including the calorimeter) must remain unchanged; otherwise, the data comparison is no longer possible. 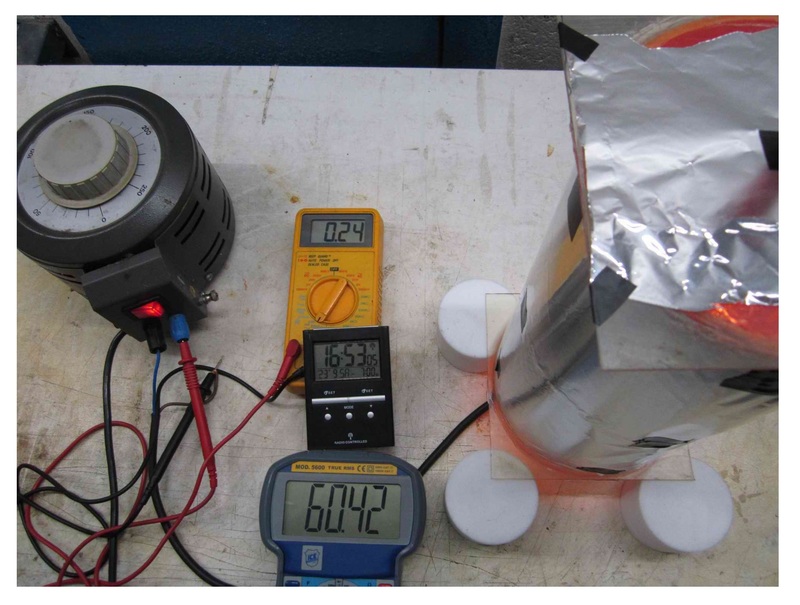 Using the dummy reactor an empirical D= kS can be developed for different temperatures. The k can be used to estimate D in the active. A series of k’s has been tabulated. k increases with T. In future replication for a selected optimised product ancillary calorific method may be considered to directly measure D.
(A6) The described procedure may be seen the typical one for a calorimeter. The problem is that, usually in order to make a good calorimetry, D should be very small and in particular in this case it should never exceed one-tenth of E. In Mizuno’s calorimeter D, as calculated, is ca. 0.5·E a value absolutely unacceptable. To clarify, this is equivalent to determine the weight of a neonate placed in the mother’s arms by a normal scale, instead of to lay the neonate directly on an accurate infant scale; the weight, determined by difference implies, a high measurement error, especially, in case the mother weight was a long time before determined or effected under different conditions (e.g. dressed differently). (A7) Mizuno does not link or provide any raw data in his papers. You linked two Excel spreadsheets in your comment, the first doesn’t work and the second opens a spreadsheet titled: “120 W input excess heat result shown in Fig. 28” but the curve of the Excel graph “Wout and Win” differs significantly from Fig. 28 of the document, so this spreadsheet is useless. Moreover it contains formulas and arbitrary coefficients, that even who provided this file it was not able to understood, therefore we do not spend time on these uncorrelated data (Excel plot does not match any curve of Fig. 28) nor on calculation made using coefficients arbitrarily introduced. (Q8) “the most sensational is the measurement of the fan flow equal to twice the maximum value declared by the manufacturer” The author amended the flowrate.in August,2017. Is the GSVIT statement still valid? Also the last document revision continues to quote a largely overestimated air flow rate for power calculation, we have clearly shown that the used blower can’t generate that flow rate order of 65 m3/h or more. Some Q&A available at the bottom of the Post. Complimenti per l’ottimo lavoro. Da parte mia ho preso l’iniziativa di tentare una replica dell’esperimento di Mizuno su scala ridotta e con una metodica diversa per la deposizione del Palladio sul Nichel. Ho preparato un breve report sugli esperimenti che vorrei porre alla vostra attenzione se siete interessati. Non ho visto alcun eccesso di calore, ma accenno di lievi reazioni anomale si. Fatemi sapere se interessati al report. Grazie per il commento e per l’apprezzamento del ns lavoro.